Create a professional book-like binding with these GBC A4 Thermal Covers. Thermal bound documents are held in place with a strong adhesive in order to withstand the wear and tear of repeated readings. Each cover has a 150 micron crystal clear front with a 200 gsm white cardboard back. Suitable for use in most thermal binding machines. 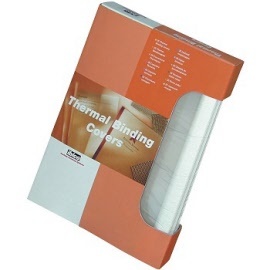 Pack of 100 White Thermal Binding Covers.